Deputies with the Albany County (NY) Sheriff's Office were caught on camera in an act of kindness for elderly citizens trapped in their homes by a recent blizzard. When it was established that the individuals were safe from the inclement weather, the deputies took snow shovels in hand to clear the snow from front steps and sidewalks. Image courtesy of Albany County PD / Facebook. Deputies with the Albany County (NY) Sheriff's Office were caught on camera in an act of kindness for elderly citizens trapped in their homes by a recent blizzard. Sheriff Craig Apple posted images on Facebook of some of his troops performing welfare checks on at-risk citizens listed on the agency's "special needs" registry. 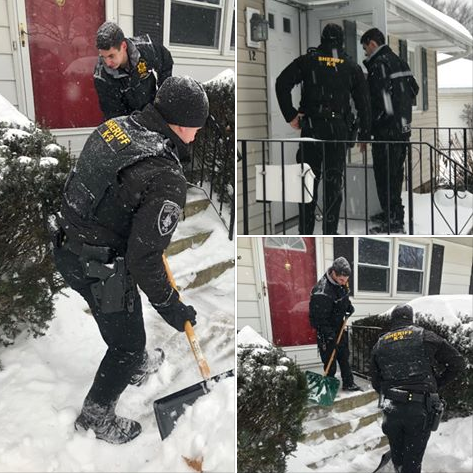 When it was established that the individuals were safe from the inclement weather, the deputies took snow shovels in hand to clear the snow from front steps and sidewalks.